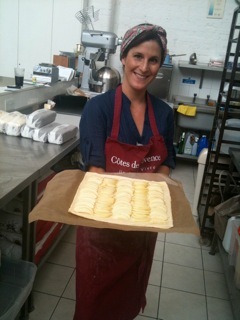 Louise Kenney completed the Ballymaloe Cookery School 12 Week Certificate Course in September 2009. Here's what she says about her time here. September is the best possible time to learn about food and growing it, as Autumn is such a bountiful time! I had been working in the charity sector for 5 years and had come to my end with doing a job I wasn't passionate about. I quit that job in May 2009 and decided to take some time out to focus on the things I loved - one of which was food. A good friend had taken the 12 week certificate course back in 2002 (Kirsty Lee) and she loved her time and had found the training invaluable for her life which followed. I also heard about the course through Bas and Henrietta Thewes who I worked for in Perthshire, Scotland after my time at university. Since completing the course I've been cooking pretty much non-stop! I've had various jobs ranging from making hundreds of scotch eggs for a market stall on Broadway Market (Andy Bates from Eat My Pies) and working in an independent cafe as their in-house Cook to being a Food Styling Assistant. I am currently working for myself as a Chef & Caterer and cook for a number of private clients and businesses around London and further afield. I'm trying to move into the publishing world at the moment, so I'm assisting as many food stylists as I can to get experience and useful contacts. Catering has been fun and I'd like to stay in the food world but learn some new skills: recipe development/ testing and styling/ writing are particular interests right now. My previous business was a catering company based in SW London called Bobsiloula. I have done some work with lots of ex-Ballymaloe people: Peter Narizzano and Clemmie and Flossie Bielenberg. However now I do food styling mainly. I loved the entire course. I was very taken with the work ethic and also the emphasis in delivering the very best to your clients. I found most what Darina spoke about in terms of local suppliers and building good, trusting relationships echoed what I'd learned in my past employment. I loved all of Rory's classes/ demos and the wine course was brilliant! I also thought the economics of running a business was key to helping me think and plan the finances for Bobsiloula Catering.